Recently I was hungry and scrolling through io9, and I found myself wondering what certain Pokemon taste like. It isn’t the first time I’ve thought about devouring a fictional creature—I’ve been imagining slicing into a tender Star Wars porg chop ever since we asked a bunch of food experts what the adorable waterbird tastes like. 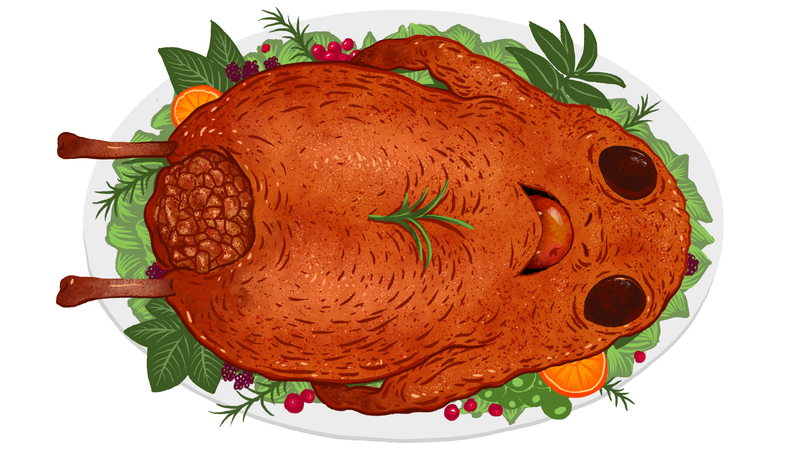 As Thanksgiving was approaching and everyone was already contemplating what meals they were going to be preparing, I thought it would be a good time to pose the question to my esteemed colleagues: What fictional animal would you like to include in your Thanksgiving feast? Some other good beastly suggestions: Jabba the Hutt strip steak, Grinch meat, Fawkes the Phoenix (“natural hot wings”), escargot made from the giant racing snail in The Neverending Story. Rutherford opined whether or not Cookie Monster would retain some of the cookiness of his diet. “If he’s meaty but with cookie sweetness, he’d prolly be delicious BBQed.” Rutherford wrote. What about you? What exquisite creature would you like to pick up from the inter-dimensional supermarket and include in your feast?